Nothing more than a mindless,Knee jerk, Sunreader solution that is both simplistic and doesn't work as a deterrent. But that wont stop this bunch of tea-party wannabe's from trying. I'd vote no to hanging as well but I certainly don't feel morally superior to those who'd vote yes. 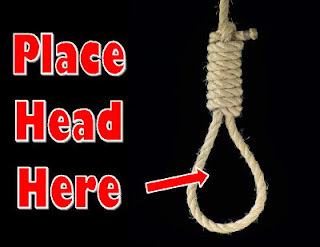 A pro-hanging MP once said in Parliament that he would willingly be the hangman. Ted Heath asked would he willingly be the innocent man hanged by mistake? Good question. But there's another good question... would you willingly be the person murdered by a released murderer or would you be willing for someone close to you to be murdered by a released murderer? Getting on for a 100 people have been murdered in the UK by released murderers since abolition. A right-wing thing? I wouldn't have thought so, Cuba for example still has the death penalty as have many other left-wing states. I should have said "as have many left-wing states in the recent past. As to full disclosure, again correct in principle but in reality ... would you be happy for full disclosure if you were a witness in a case involving, say, the Adams Family? Anon 14 Aug 1839 - It is very much a left wing/right wing thing in the UK (which is what this is about). The abolition of Capital Punishment was one of the founding principles of the Labour Party and the gradual moves towards it - which took decades - were mostly introduced under Labour Governments. Yes but I suspect to day labour as a socialist party has died, these days it what the opinion polls says that drives Labour. I had to sit and listen to Cameron and Miliband today, MIliband telling us about walking to school down the same road as the rioters. When he lived in a council house. Then I remember what Labour stated when Ms Flint was in charge of housing, if they have no jobs then fling them out of council houses, same as the Tories today.